Who is it for?Snail BeauuGreen Essence Mask contains snail extract for fast vitality from the damaged skin so masking 20 to 30 mins with this unique face mask gives energy to your tired and lifeless skin. Step 4: peel off slowly from the edges, gently massage your face with remaining essence on skin till it is fully absorbed. No need to wash off. Avoid on blemished, pimpled and sunburned skin. Stop using if skin becomes red, itchy during or after using. If skin is peeled off and the above symptoms persist, discontinue immediately and consult with doctor. Normal sheet mask packaging which has metallic film inside which keeps mask cool. Mild fragrance does not irritate nose. normal white colored basic sheet mask but it has some unique cut and fold which wraps and stays easier on the face. Also I felt the tissue used in this product is bit thick so no way u will end up tearing the mask while unfolding. I keep on trying new sheet masks what attracted me about this mask this that “snail extract”(Like it was kind of exciting and nervous to try this out). 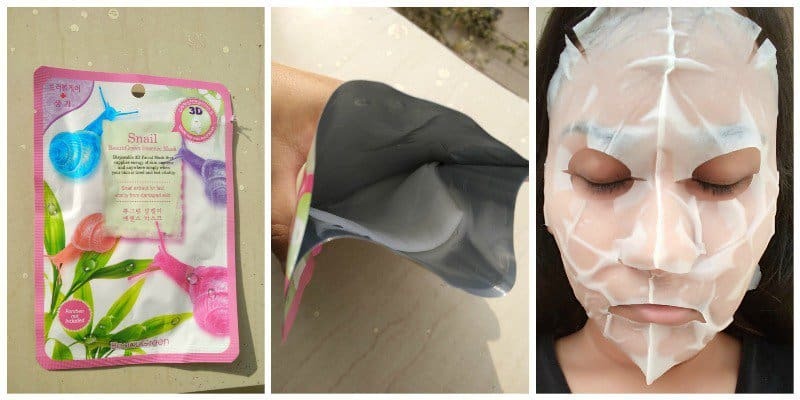 Like other sheet mask this product is to be applied on clean and dry face then relax for 20 to 30 minutes which lets the serum in the mask sink into the skin. It’s unique cut and fold has impressed me a lot it is actually lot easier to unfold and put the mask on the face. After application need no need to wash off face and I personally like to apply the leftover serum in the mask to my arms and legs. After application I feel my skin to be soft and smooth but no as such remarkable brightening effect which I can share. What do I like about this mask? What I dislike about this mask? Yes definitely. It is actually a good way to pamper of your skin with sheet mask and it can be applied daily. So this brand has affordable option to try out various sheet masks. I would definitely repurchase this variant as well as try out other variants.